Diving crew of the U.S. Navy inspecting the USS Maine’s forward aft wreckage. “SPANISH TREACHERY!” announced one headline on Feb. 16, 1898. “DESTRUCTION OF THE WAR SHIP MAINE WAS WORK OF ENEMY,” speculated another. A court of inquiry led by the U.S. Navy to investigate the mighty explosion which had torn apart the USS Maine and sent 262 patriots to their watery graves did little to console the anger many Americans felt. And the posed threat seemed greater than what officials had concluded was a mysterious submerged water mine: the kingdom of Spain. 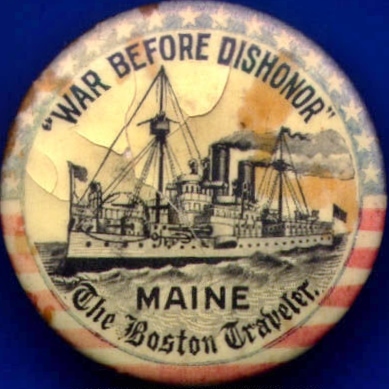 Patent memorabilia like this button by Whitehead & Hoag Co. were persuasive in appealing to patriotism for war support. Illustrations taken from photographs graphically depicted Cuban victims of famine while under Spanish control. “THE SPANISH BRUTE” depicts Spain as a bloody apelike murderer killing Americans in its path. 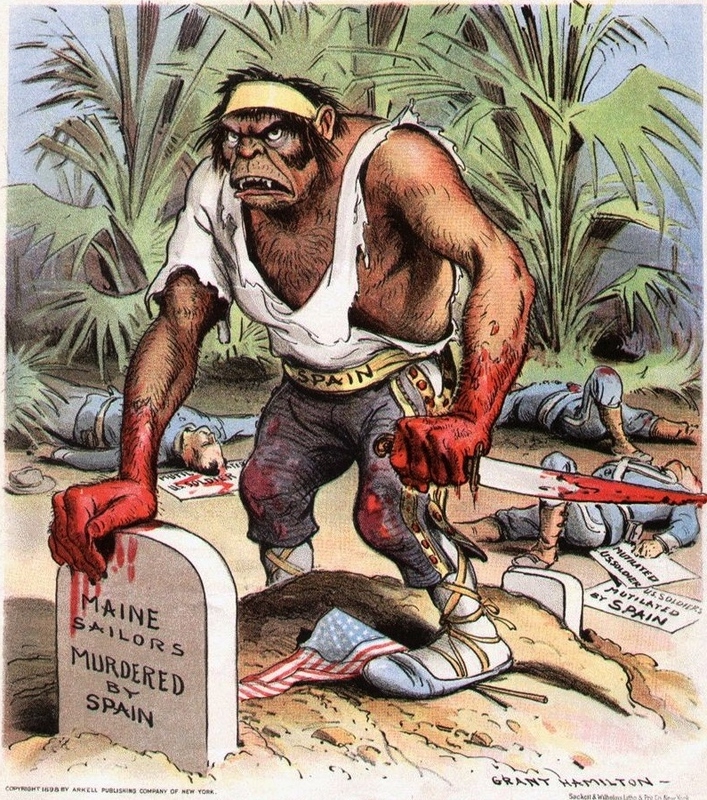 The Maine disaster was simply the latest heinous act by Spain. For months, citizens had grown agitated with Spanish attempts to control their far reaching colonies and media syndicates like the Hearst-Pulitzer owned New York Journal and World only stoked the fire of nationwide hatred. From showcasing the shocking execution of Cuban teenager turned revolutionary Adolfo Rodriguez to scolding the deplorable conditions of Havana jails, what Americans read from millions of newspapers was that Spanish Rule was evil. No one hoped to confront the Spanish aggressor more than Theodore Roosevelt. Raised in the shame that his father had taken to bribe a substitute in the last remembered Civil War, he sought personal redemption for what seemed to be a family tradition of inactive military service. According to Historian Douglas Brinkley, T.R. spent his entire life, “anxious to prove that cowardice didn’t run in the family’s bloodline.” Self-validation by warfare also reaffirmed Roosevelt’s thoughts about social Darwinism. From the pages of Edmond Demoulin’s Supériorité des Anglo-Saxons (1897) or On the Origins of Species (1859) he concluded that natural selection bred a elite class of homo sapiens. “Through all nature it is a case of survival of the fittest,” Roosevelt stated plainly, referring to nose sizes and wingspans of mosquitoes and enduring old trees as examples. Furthermore, every generation’s heroic few (typically white Anglo-Saxon intellectuals) had a moral responsibility to combat recurring evil and protect the weak. 39-year old Theodore Roosevelt served as Assistant Secretary of the Navy under John D. Long before the war. His cousin Franklin D. Roosevelt occupied this same office and post in 1913. Political cartoon showing T.R. checking Europe’s attempt to grab the New World, a measure that proved far more costly. While not a strict purist, Roosevelt believed this philosophy had practical application, especially “to drive the Spaniard from the New World.” He disdained the oppressiveness of European power that had left Cuba impoverished and challenged the longstanding policy of Monroe Doctrine. But newly elected President McKinley didn’t share Roosevelt’s vengeful attitude. “War should never be entered upon until every agency of peace has failed,” McKinley argued, hoping to resolve the crisis diplomatically. Roosevelt was appalled at his superior, famously declaring that McKinley had “no more backbone than a chocolate éclair.” Up until the explosion of the Maine the situation had seemed more like a humanitarian mission. Now it had become a military imperative. Roosevelt shown in full attire. He loved being called “Col. Roosevelt” and hated “Teddy”. The United States officially declared war with Spain on April 25, 1898. Since that time Assistant Secretary Roosevelt had not been idle, having diligently mobilized the U.S. Navy on paper and secured contracts with key strategists. These preemptive measures led to a brilliant victory by Commander Dewey and the model U.S. Asiatic Squadron in Manila Bay. But as he sat on the sidelines, Roosevelt’s obsession about the idea of personal involvement grew. “I cannot disregard the fact that my power for good, whatever it may be, would be gone if I didn’t try to live up to the doctrines I have tried to preach,” he explained. Frustrated, he resigned his post and lobbied the Secretary of War for a more interesting role. Abandoning the office allowed time for more outdoor possibilities. So when the call went out to muster a regiment of rugged volunteers for the Cuban invasion, Roosevelt jumped at the opportunity. In rapid order he was commissioned lieutenant-colonel (deferring authority to his friend Col. Leonard Wood), procured a khaki ensemble from Brooks Brothers, and unlike his father, left his six children in their mother’s care before departing to San Antonio, Texas for training. Shown front and center, Col. Leonard Wood and Lt. Col. Roosevelt (right) drilling the unit in San Antonio, Tx. Roosevelt’s refusal to hire careerist Army officers led to notorious stubbornness and insubordination. Roosevelt conferring with celebrated journalist Richard Harding Davis at Tampa Bay, Fl. Davis’s coverage of their exploits helped catapult the future president’s career. Once again, highly publicized media drew attention to Lt. Col. Roosevelt’s recruiting call to form the 1st U.S. Volunteer Cavalry. More than 23,000 applications flooded the War Department’s office but only half were selected. Members of “Teddy’s Texas Tarantulas” (later renamed “Roosevelt’s Rough Riders”) consisted of cowboys and ranchers, Harvard students, Texas Rangers, and world class athletes. “We have a few [non-native birth men] from everywhere including a score of Indians, and about as many of Mexican origin from New Mexico,” Roosevelt wrote. Outfitted in cowboy garb, the colorful band seemed to contradict Roosevelt’s theory about being upper crust saviors in the traditional sense. But then again, neither did he. As one biographer put it, Roosevelt embodied both his socialite East and cowboy West. Regardless, he placed himself directly alongside the men and showed favoritism to no one other than the Riders as a whole. Rough and tough uniforms, odd pet mascots, and celebrities were showy things that held little genuine value as the men steamed for Santiago Bay on June 13. A trooper of Company H stares into the camera during a training exercise in Tampa, Fl. Lt. Col. Roosevelt and Col. Leonard Wood standing with officers of the 1st U.S. Cavalry. Maj. Gen. Joseph Wheeler (front), a veteran of the Civil War, excitedly mistook the enemy as “the damn Yankees” at Las Guásimas. When ordered to wait their turn, Roosevelt defied orders and told his men to board the steamship Yucatan en route Cuba. Things didn’t seem right when the Rough Riders landed a week later. The land was dry and shabby, Cuban buildings looked decrepit and cheap, swarms of insects and exhausting heat plagued the over-packed men, dense jungle dulled their machetes, and gigantic scorpions infested the town of Las Guásimas their objective point. Nevertheless, the Rough Riders first action there was short and violent. Sgt. Hamilton Fish II, one of the Harvard boys, was the first of sixteen men killed at Santiago. “One man was killed as he stood beside a tree with me,” Roosevelt wrote to a friend. “Another bullet went through a tree behind which I stood and filled my eyes with bark.” Their unit was sent alongside several others to assault the coastal fortifications protecting the surrounding bay and they did so with bold and determined success. McKinley tipped his black top hat of approval from afar by promoting Col. Wood to brigadier general and Roosevelt to full colonel. “I got my regiment,” he happily wrote. But the “crowded hour” (as Roosevelt later called it) came on July 1. That afternoon, Col. Roosevelt mounted his charger, Texas, hoping to outrun the stifling heat. No one expected him to survive the foolish decision. Scattered gunfire erupted from the dark jungle as the 1st Cavalry hesitantly started the march. “Are you afraid to stand up when I am on horseback?” he defiantly asked a trooper cowering in a bush. Seeing that their advance was going too slowly, Col. Roosevelt pushed through the ranks and positioned himself directly at the head, refusing to dodge bullets that whizzed by and somehow managing to change his glasses out. Cracking jokes and swearing at the men to get them moving, he coolly rode up and down the lines and picked up the momentum. Now within forty-yards of the peak, he leaped off the animal intending to finish the charge on foot. “Charge of the Rough Riders, 1898” by Frederic Remington. He witnessed the actual charge during his time as a war correspondent and was commissioned by the surviving Rough Riders to sculpt “Bronco-buster” for Roosevelt’s send off. Roosevelt’s Hartford-made 1895 Colt Double-Action Revolver was salvaged from the wreckage of the USS Maine by his brother-in-law. It was stolen from the Roosevelt museum at Sagamore Hill and recovered by the FBI in 2006. Spanish defenders greeted their attackers by opening a terrific fire upon them and sent shells screaming down from above. Amid the chaos, Col. Roosevelt noticed a large iron kettle and ordered his men to take cover behind it. Troopers were dropping like flies as the Rough Riders frantically attempted to return fire. Then the dreaded drumming sound of machine gun fire came. But it wasn’t from the enemy, it was from three U.S. Gatling guns brought up into the fray, sending 18,000 rounds of ammunition into the enemy and forcing the Spaniards to retreat. “Our men cheered lustily,” Roosevelt gratefully recalled. Excitement was so high that as Col. Roosevelt rushed into the enemy’s trenches, he was surprised to find that only five men had heard his order to follow. Ground shots hit two men before he decided to jump back over a wire fence and find the rest of the brigade. After reporting to various officers, a final rush was mounted but when they returned most of the Spanish had fled. “There were very few wounded,” he remembered. “Most of the fallen had little holes in their heads from which their brains were oozing.” He had contributed to the body count after killing two Spaniards that had fired upon him when he returned. Men were railed, the artillery was brought up, and the American flag was triumphantly raised overlooking the valley. The battle of Kettle Hill (named after the sugar processing vessel they found) was over. Col. Theodore Roosevelt and his Rough Riders moments after capturing Kettle Hill. Likely staged, Roosevelt dons his sweaty uniform for the media one last time while recovering in Montauk Point, Ny. 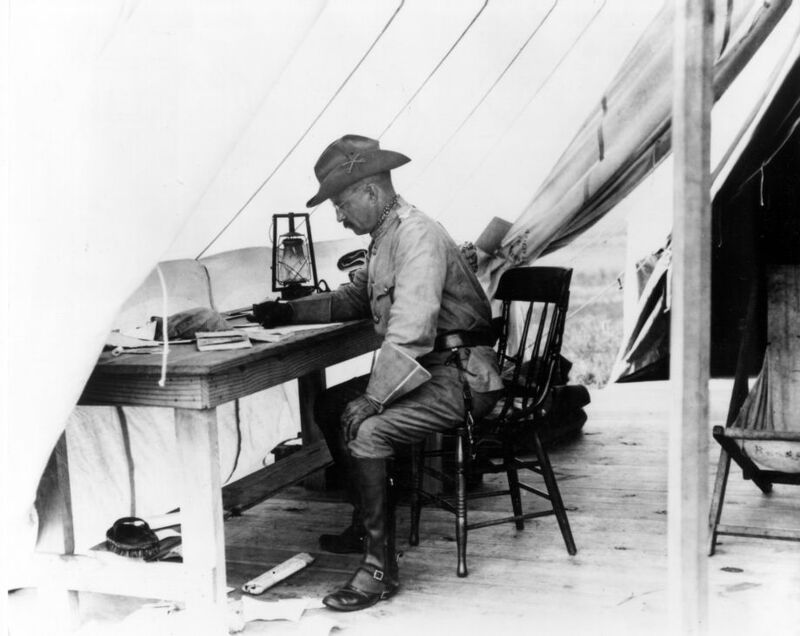 Roosevelt remembered the charge up Kettle Hill as the greatest highlight of his life. From the San Juan Heights, Col. Roosevelt looked down into the conquered valley of darkness “reveling in victory and gore,” as trooper Bob Ferguson noticed, flashing a wide grin and pointing his pistol at all the “damned Spanish dead.” Alongside them lay 89 of the Rough Riders he had coached through the oppressive heat, found canned tomatoes or a bag of beans for, and helped whenever possible, whether it was fighting disease or the enemy. What made Roosevelt great was his ability to place the welfare of his men above his own— a devolution of his social philosophy. All of the surviving Rough Riders who had lost limbs or who later stood beside him at campaign rallies testified that he was an exceptional leader. With the war ending, publications across the country hailed him as the nation’s most celebrated hero. They didn’t have to flaunt his popularity but what did gratify Roosevelt while convalescing back in New York was the sense of relief and accomplishment he felt after the Cuba experience. “Should worst come to the worst I am quite content to go now and to leave my children at least an honorable name,” he wrote to a friend. The spent cartridge shells he had collected atop Kettle Hill would make nice souvenirs for his sons and the legacy he had secured. “Cuba in 1898,” The World of 1898: The Spanish-American War, Library of Congress, accessed January 15, 2016, https://www.loc.gov/. Since 1492, Cuba was an important Spanish base that connected Old World trade routes to the New World. For a century, pesos were exchanged for African slaves to produce sugar, making Cuba a world supplier. Widening divisions between the self made planter class and government officials ignited a Ten Year’s War (1868-78) that ended ineffectually, leaving the island in ruins and devastated by famine. “Yellow Journalism,” Crucible Of Empire, PBS, accessed January 15, 2016, http://www.pbs.org/. In fact, the same newspapers who had announced the USS Maine‘s sinking had used literary techniques such as melodrama, romance, and hyperbole to captivate the nation’s attention earlier that year—a style known as “yellow journalism”. “Robert Barnwell Roosevelt,” TR Center, Dickinson State University, accessed January 15, 2016, http://www.theodorerooseveltcenter.org/. Geoffrey C. Ward and Ken Burns, The Roosevelts: An Intimate History (New York: Knopf Doubleday Publishing Group). Roosevelt’s admired uncle, Robert Barnwell (sic. ), was the only family member to serve in the military prior to his own. Differing politically, Barnwell’s allegiance as a War Democrat compelled him to volunteer in a New York militia unit at the outbreak of the Civil War. He also founded support Union groups, like the Loyal National League and the Union League Club. Edward J. Renehan, Jr., The Lion’s Pride: Theodore Roosevelt and His Family in Peace and War (New York: Oxford University Press, 1998), 23. In all fairness, circumstances had kept Theodore Roosevelt Sr. from enlistment. Pressured by his wife’s Southern ties, he was heading a seven-family Manhattan household and hoping to secure an inherited financial firm (Roosevelt & Son) amid domestic war. He did contribute in other charitable ways by creating a dependent’s system for soldier’s families. Douglas Brinkley, The Wilderness Warrior: Theodore Roosevelt and the Crusade for America (New York: Harper Collins Publishers, 2009), 53. “Timeline,” Crucible Of Empire, PBS, accessed January 15, 2016, http://www.pbs.org/. Theodore Roosevelt, The Rough Riders (New York: P.F. Collier & Son, 1899), 126. Shortly thereafter, the hostilities ended with the Treaty of Paris which deeded the colonies of Guam, Puerto Rico, and the Philippines to the U.S. The “splendid little war” had lasted only ten weeks and had cut off the Spanish Empire, placing America on to the world’s table. Lt. Alonzo Cushing, West Point Military Academy, Class of 1861. In 1863, Alonzo Cushing would find himself within the eye of the largest engagement of the American Civil War: Gettysburg. Twice-wounded while desperately attempting to return fire, Cushing defiantly ordered more guns to the front, with an orderly-sergeant propping him up on his last remaining piece. “That’s excellent!” he told his men, “Keep that range.” Seconds later, he was struck in the head by a bullet, dying, as his battery fired their last rounds against the advancing enemy. For his actions that day, his descendants were presented the Congressional Medal of Honor by President Obama in 2014, 151-years later. I had fun researching appropriate colors (17!) for that sharp West Point uniform too. The most challenging bit was the rare M1840 cadet sword which apparently had a silver hilt and brown leather scabbard. Upon closer inspection, I also determined that Cushing’s had two decorative knots: one of brown leather, the other of gold-gilt.